Labor Day is here. For most of us, that means a day off work, the beginning of school, or a bid adieu to summer. But how did the first Monday of every September become a holiday? From its murky origins to its present day vacation placeholder, the history of Labor Day is a long one. This idea of a company town was not new. It was a common practice among mining companies to establish these towns to minimize payout to employees. With upcharges for everything, a miner’s take-home check diminished to the point of nonexistence, and at times a miner could owe debts to their companies. Some executies established company towns to maximize profits. But Pullman’s idea was radical. Outside the lure of a frenetic Chicago, a town of peace, order, and prosperity would exist on the foundation of labor rights. According to Pullman, a company-owned town could be good for workers because the company controls value of goods. And since the company also determines paychecks, the worker, in theory, would require less compensation for a high-quality life. The company town would provide a prosperity to its workers unattainable in other towns. 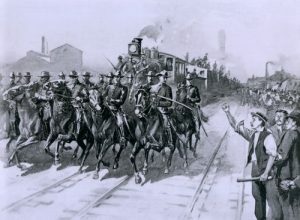 During the Pullman Strike of 1894, the first meat Train leaving Chicago Stock Yards was escorted by United States Cavalry, July 10, 1894. The reasons for the Pullman Strike were many: Pullman disallowed any employee from buying or renting a house outside the company town; Pullman had a “paternalistic” governing style, forbidding any democratic initiatives to influence governance; and, as profits and paychecks declined with the demand for Pullman cars, rent remained unmoved. As the strike gained attention, the American Railways Union (ARU) joined the cause, led by Eugene V. Debs. The ARU called for a nationwide boycott of Pullman cars. Union and non-union members eventually rioted, burning railcars and obstructing railroads. When the Pullman Strike ends, the ARU disbands, Debs finds himself in prison for six months, and Pullman employees sign pledges stating they’d never unionize again. The outfall stultified union growth and development across the nation until the Great Depression. 1894 was an election year. And Cleveland’s tactics for ending the Pullman strike was looked upon as ignominious. Picking up on sentiment from union workers in New York City, who in September of 1892 took unpaid time off to protest for a national labor holiday, Cleveland sought to appease working voters. Six days after troops toppled the Pullman strike, a national labor holiday bill appeared on Cleveland’s desk, after passing through Congress with unanimous favorable votes in both houses. Thus Labor Day was born. Though a century displaced, the spirit of the labor holiday movement can be seen in eight hour work days, overtime pay, vacation days, and many other modern labor laws. But the intention of Labor Day seems all but lost. According to “Labor Unions in the United States,” only about 11.3% of United States workers belong to unions, down from some 35% at peak membership in 1954. [VI] Seen as vital around the turn of the 20th century, and following massive organizing efforts after WWII, reflections on labor and work seems to have dwindled with union politics. For many people, Labor Day weekend signifies the unofficial end of summer. And for most, it is enough to spend time with family and friends, with a day off from work. The post A History of Labor Day appeared first on Apartments For Us.